Increases the capacity of the stomach or rumen. 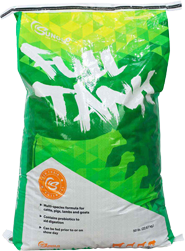 When limit feeding, adding Full TankTM maintains “gut fill” and keeps the fresh, expanded look. Reduces stress level and hard look associated with low feed intake. Contains probiotics to aid digestion. May be added to a holding ration weeks prior to the show. Can be fed leading up to show and on show day for added fill and gut expansion. Convenient when intake is restricted to limit weight gain. 1/8” pellets help reduce waste and increase palatable across all species. More efficient than beet pulp alone. Please refer to attached tag for ingredients and important information. Cattle 2.0 to 5.0 lb. Sheep 2.0 to 5.0 lb. Goats 2.0 to 5.0 lb. Pigs 2.0 to 5.0 lb.